Baron, don't forget to talk about the SEALs and Marines you habitually beat up on 2 and 3 at a time, as you PM'd me about. Perhaps it is a lube issue, seems obvious now. Seriously though, it’s good to see you posting again. You have been missed! Holy crapola. That's off the chart good. Quite well? QUITE WELL!!!! FRICKIN AMAZING!!!! So great to see you back on the hobby horse and producing such beautiful work again so soon after picking up your paints! Thanks Nerdy! It’s great to be back and seeing some of the regulars are still around painting and posting! Thanks Luther! Been awhile and I’ve kept up to date with your paintings through FB. Your primaries stuff is fantastic though still a bit sad to see you’ve sold your BAs. inmygravenimage wrote: Holy crapola. That's off the chart good. That totally blows me away Egg... not enough superlatives in my vocabulary to express my admiration for your skill. Gitsplitta wrote: That totally blows me away Egg... not enough superlatives in my vocabulary to express my admiration for your skill. Thank you gents! Appreciate it! Whole thing took about 1.5 cans of rattle cans and quite a bit of airbrush primer to get a clear and even coat on all surfaces. 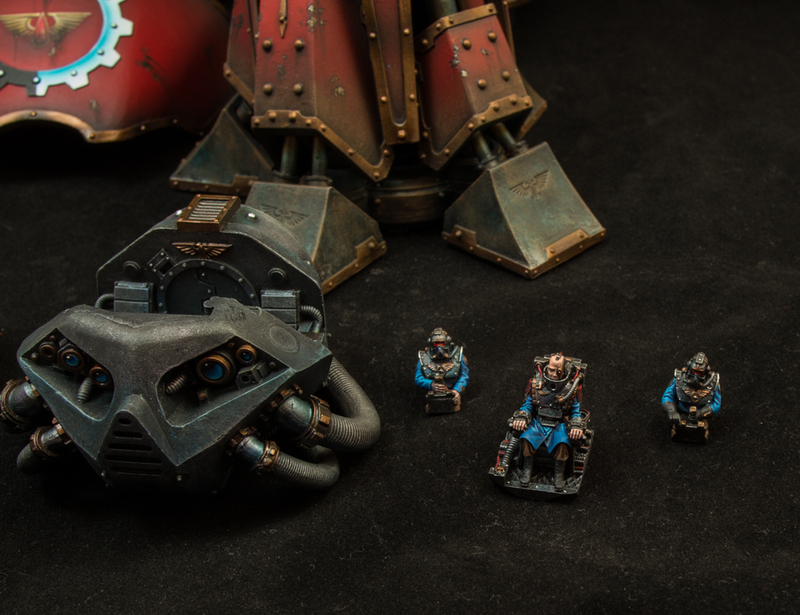 Is he going to be BA themed, or a forge world? BA themed of course! 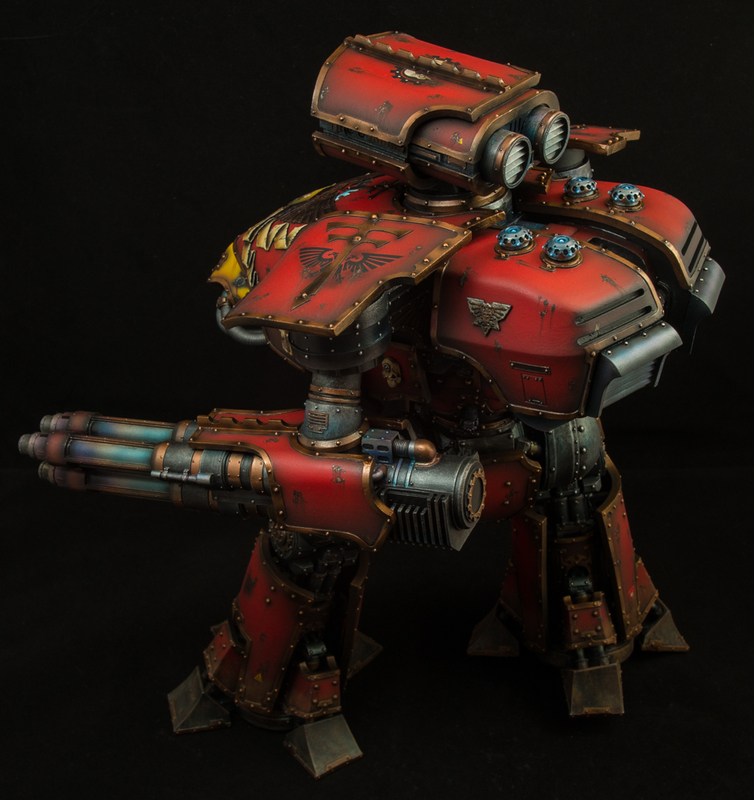 Similar to my Lucius warhound. 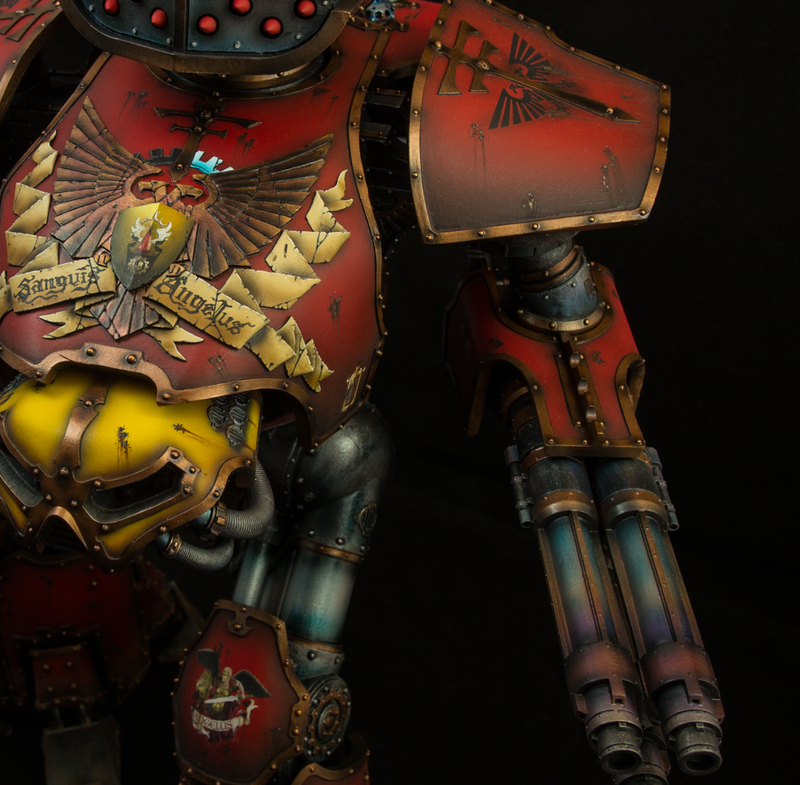 Red armor panels with yellow head though I haven't decided if I want to do any yellow strips or any other types of flourishes. 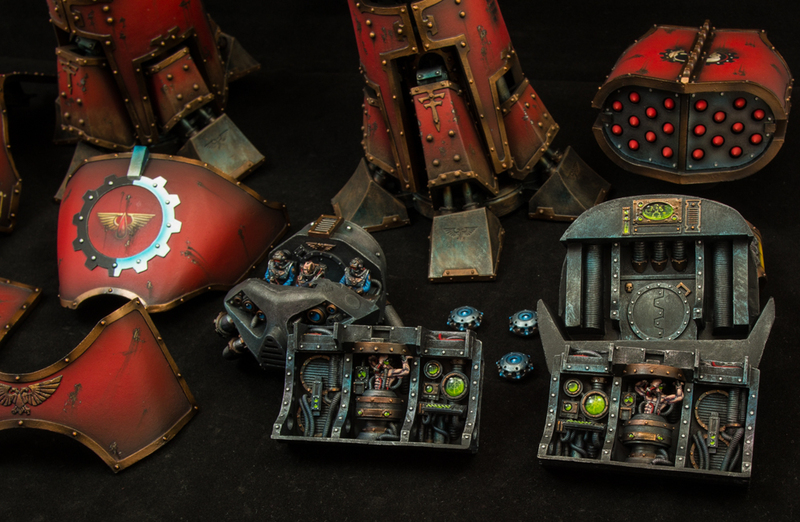 Ended up backing the project and getting super pumped about creating awesome killteam/necromunda terrain...even though I've never played any of those games not to mention I didn't have a 3D printer at the time. A week before the kickstarter ended I had a 3d printer ordered and shipped. Following it's arrival, I spend a considerable amount of time researching how to use it and work with 3d STL files. 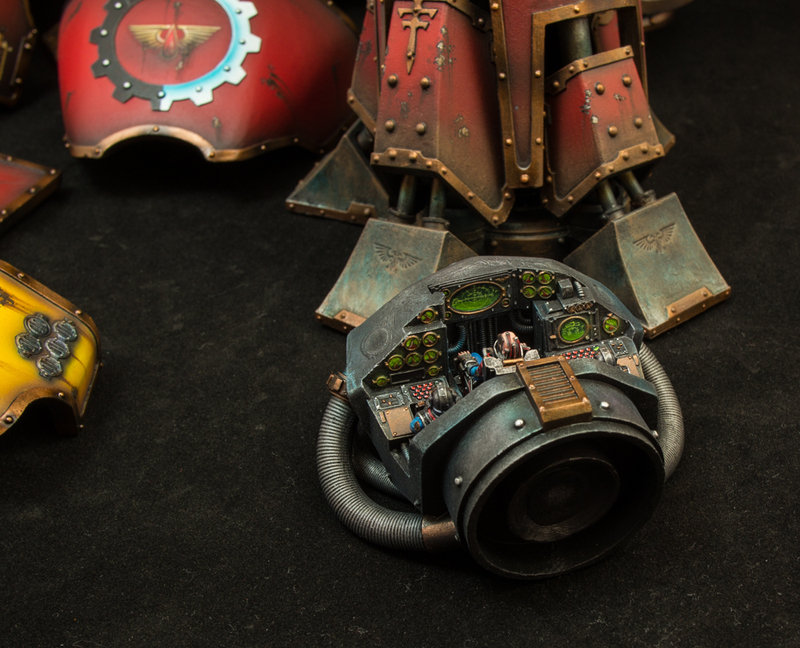 Once I had it setup and configured I felt like a techpriest enginseer with a load of STCs! Thanks! Haha yes, I suspect they'll be a lot more popular at that point. Given how fast the industry has progressed within the last 5 years, I wouldn't be surprised if something like that was available within the next decade. 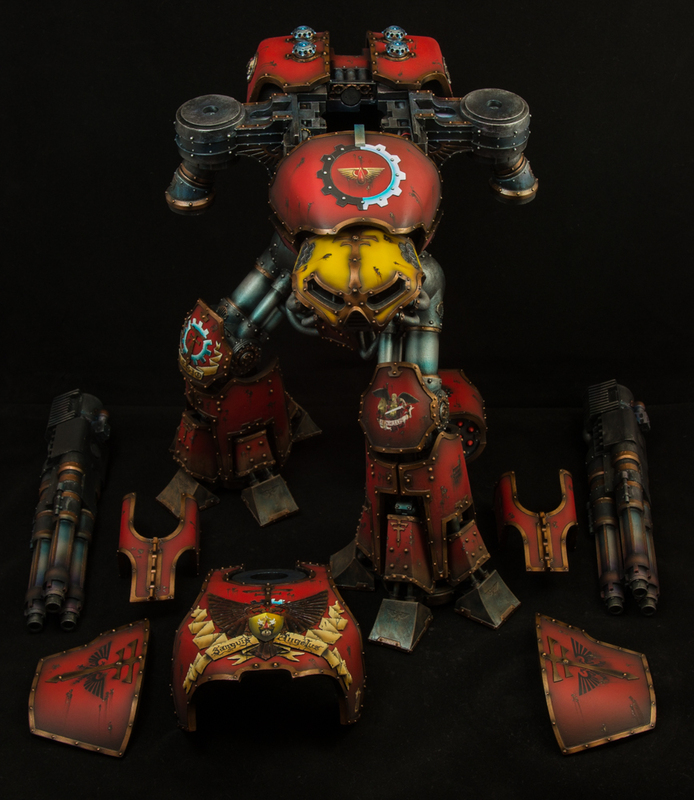 New year new Reaver Titan! 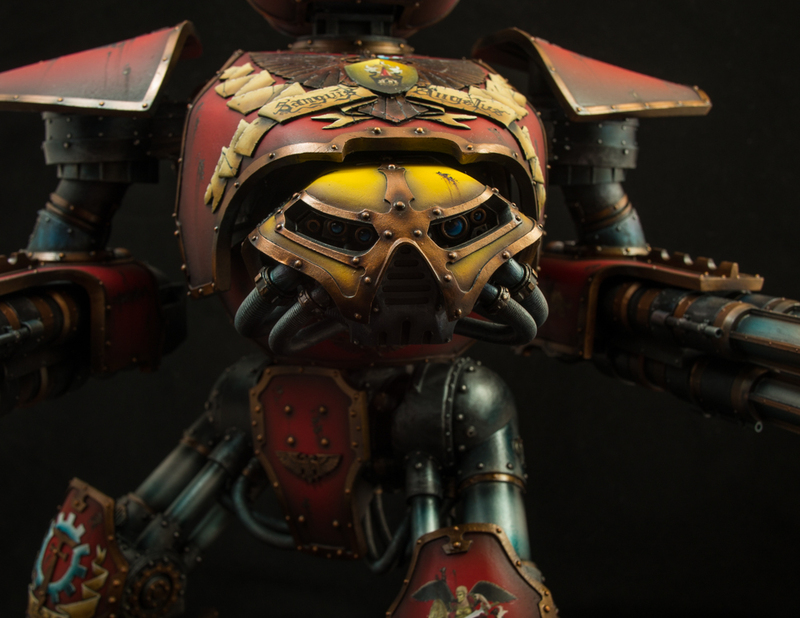 After a few more painting sessions over the Christmas holidays and the past few weekends, I finally finished off this gigantic model. 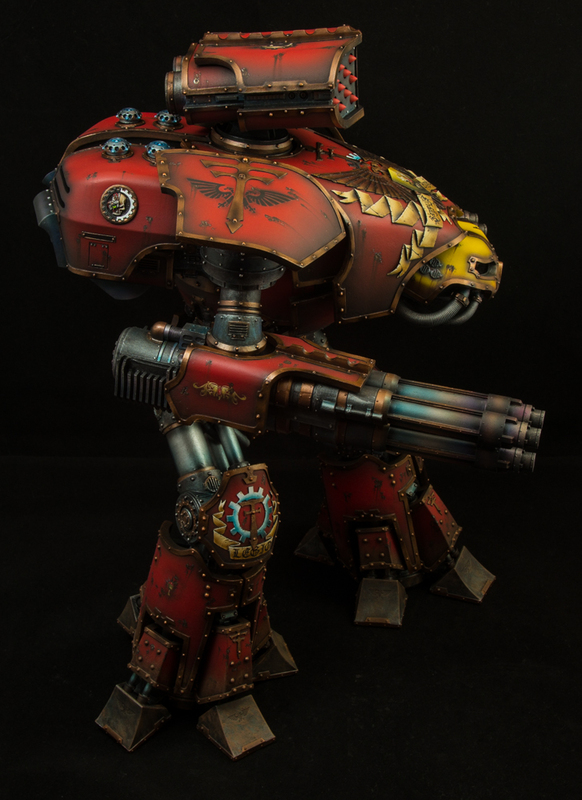 Looking back in my email archives, I bought this back in 2013 and only assembled it last year and finally painted in the past 3 months. 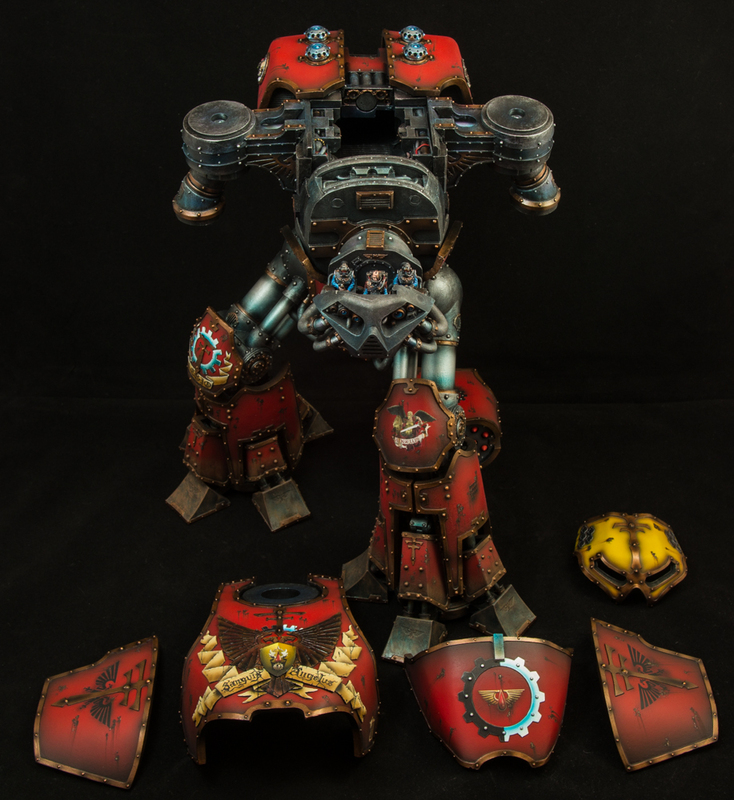 This reaver has been painted in as a Freeblade that's aligned with my BA chapter. 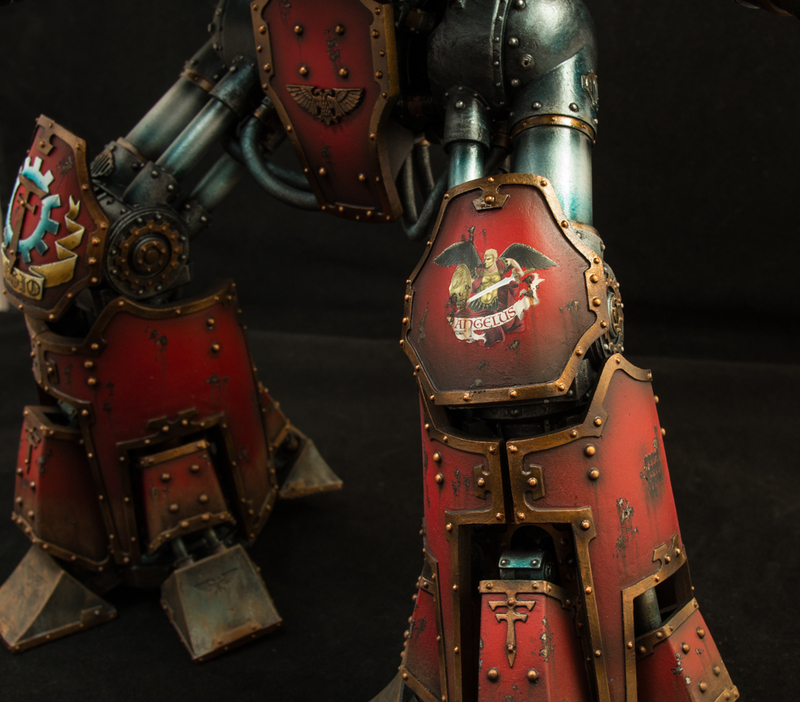 Name on the carapace is simply Blood Angel (Sanguis Angelus) and is meant to blend in well with the rest of my army and the previous Lucius Warhound in my collection. 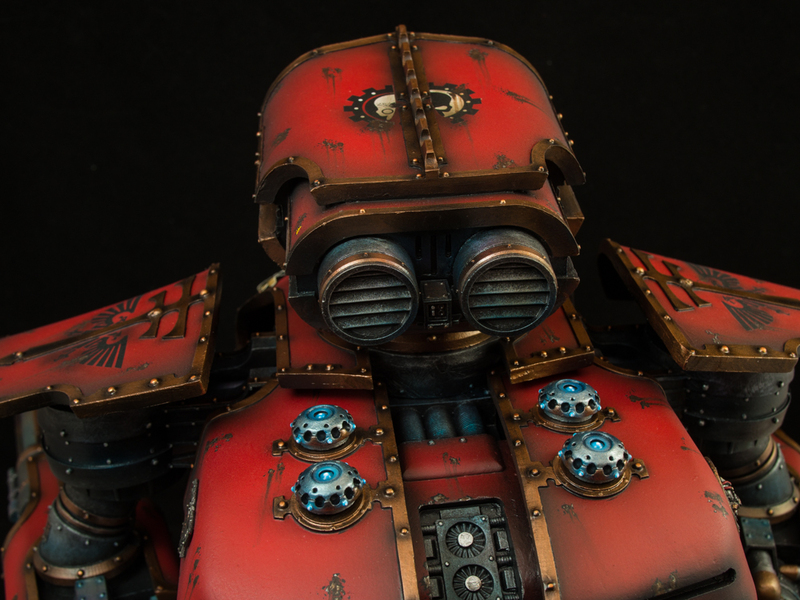 Overall the model got the full detailed paint treatment as I do with all my other models from interior and exterior. 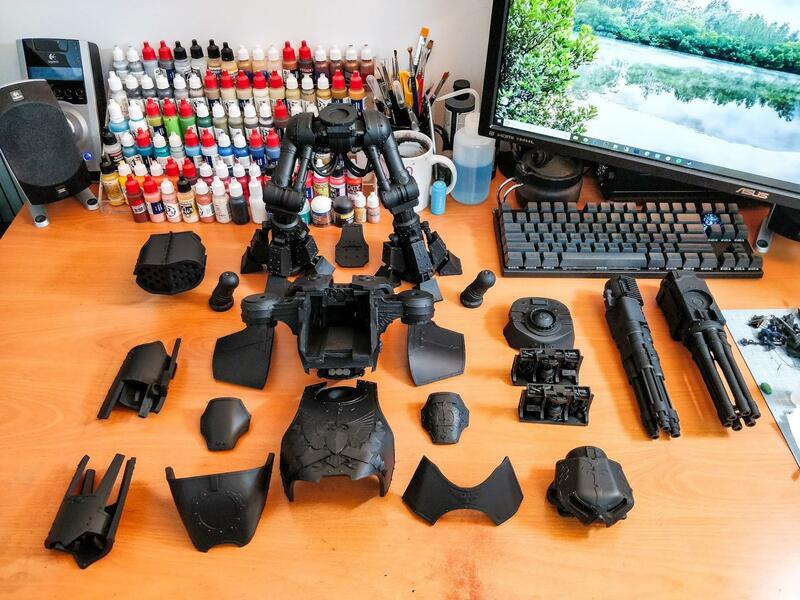 Almost all parts are fully magnetized so it can be completely disassembled and removed for inspection (including interior details and princeps and moderati). Weapon arms for this beast are dual laser blasters, gatling blaster and titan grade powerfist. I do have the chaiinfist on order and will add that once it comes. Arms are all attached via screw and nut at the shoulders and then with larger magnets at the actual weapons. The power fist actually articulates are the wrist and elbow for posing (pointy fist!). That's simply staggering. 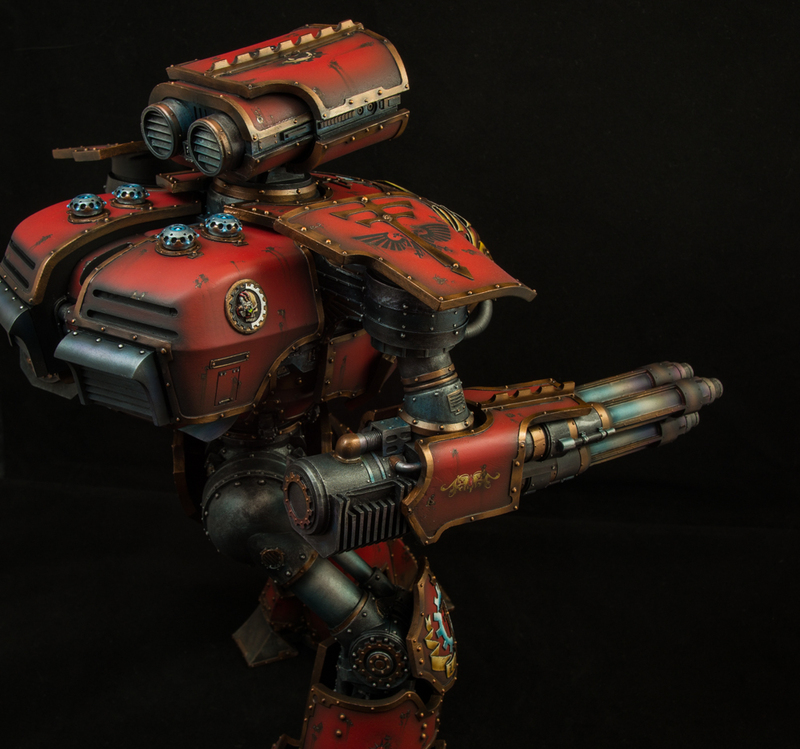 Talk about doing a model justice! 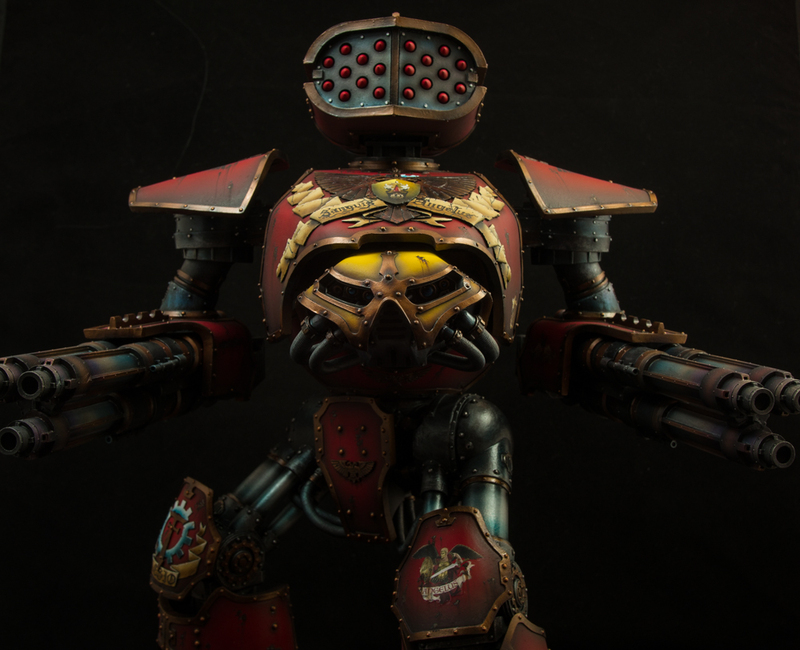 First this then the Sanguinous preview? 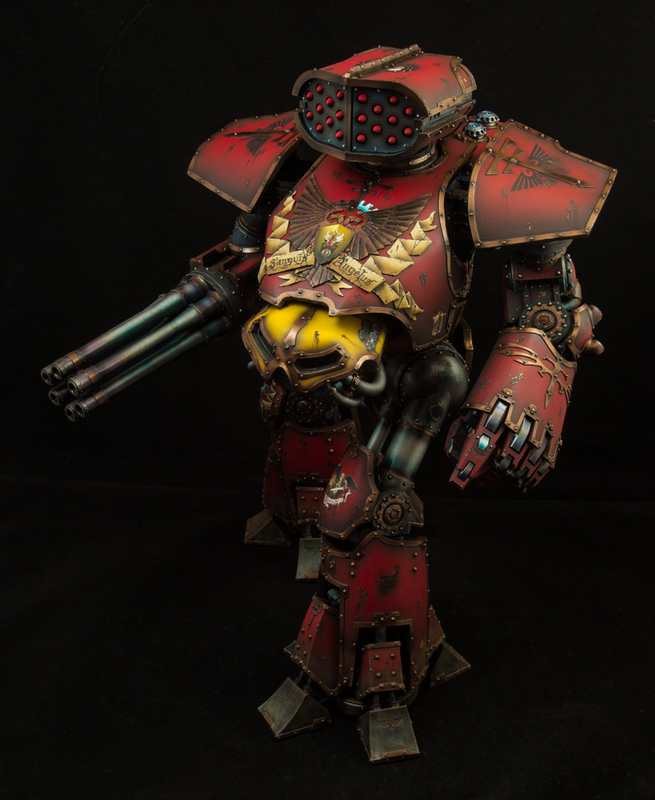 Good day to be a Blood Angel. It leaves me breathless Egg. inmygravenimage wrote: That's simply staggering. 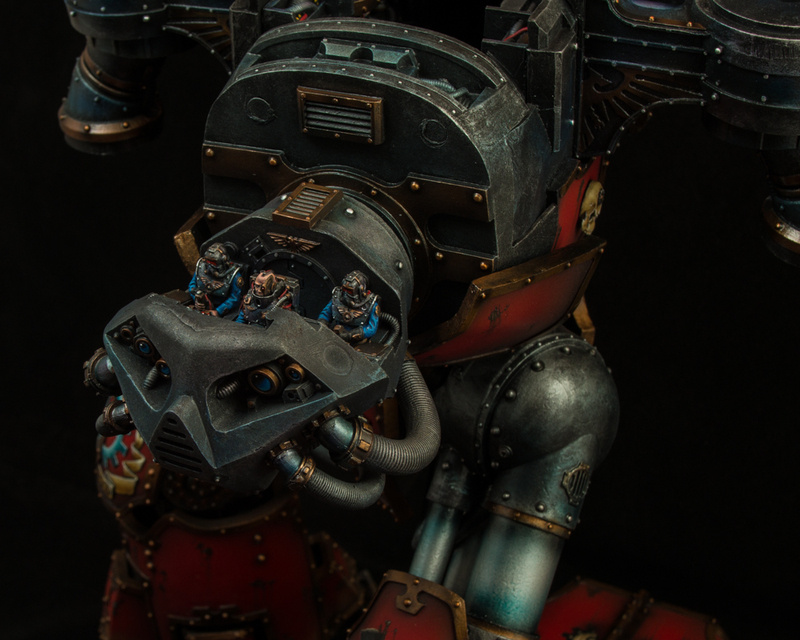 Talk about doing a model justice! 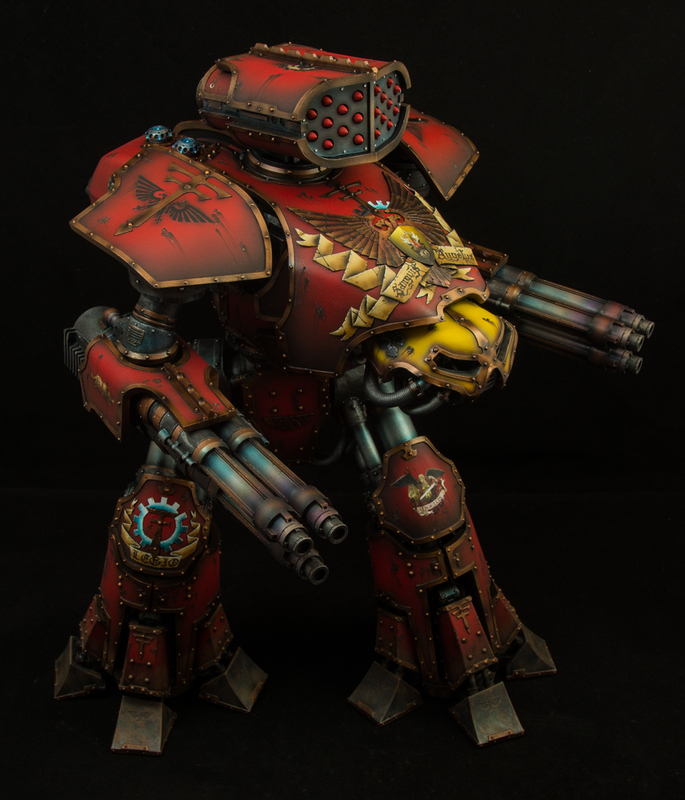 whalemusic360 wrote: First this then the Sanguinous preview? 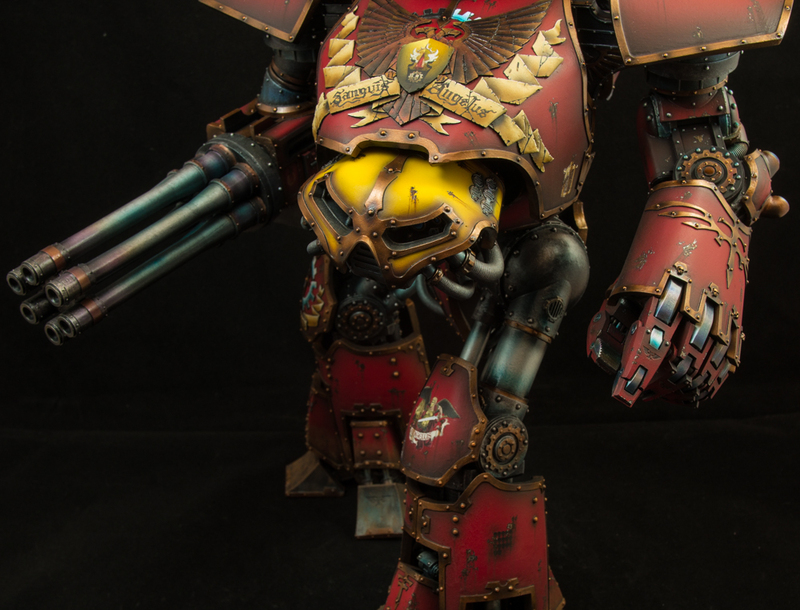 Good day to be a Blood Angel. Everyday is a good day for a BA fan. 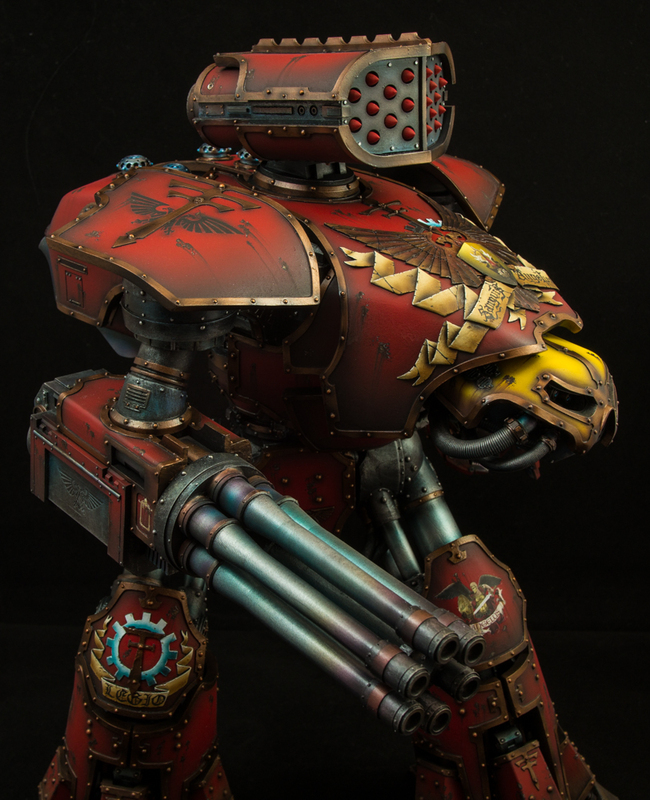 Actually I'm not too thrilled about the Sanguinous model but hoping it will grow on me. Gitsplitta wrote: It leaves me breathless Egg. As always, your skills are top notch and your work inspirational. jabbakahut wrote: As always, your skills are top notch and your work inspirational. Hahahaha thanks Tom! Glad to see you're still around Hope you're still in the painting side of things these days! Just spotted this - that's a stunning Titan Eggroll. It may have taken 5 years to get around to it, but when it was finally finished it was worth the wait. Splendid! Nice, should be a good gaming community in that area. You should definitely get back into it! Bellerophon wrote: Just spotted this - that's a stunning Titan Eggroll. It may have taken 5 years to get around to it, but when it was finally finished it was worth the wait. Splendid! You're leaving the great white north?! Thanks! My red has changed a lot over the years (due to paint range changes). 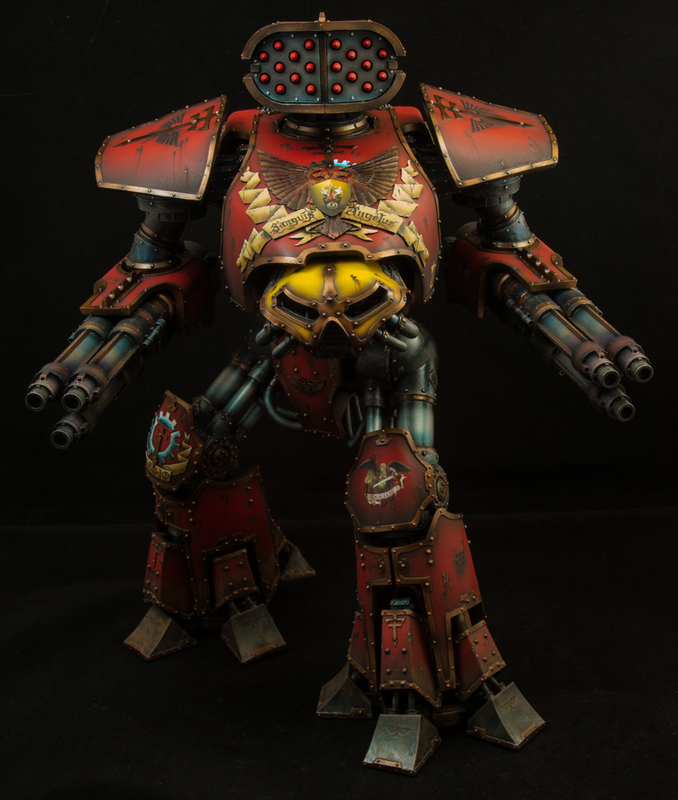 Currently, and also for this Reaver, I used a basecoat primer black, airbrushed base of mephiston red and airbrushed highlight of evil sunz scarlet. 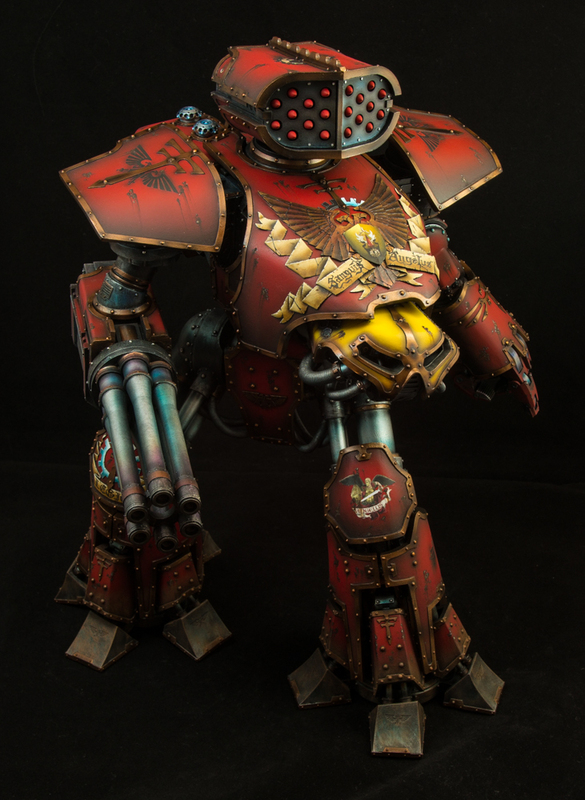 I do have a small bit of GW Blood Red from way back in the day that I'm saving for just specific units - haven't been able to find a matching red since it's always been my favorite. 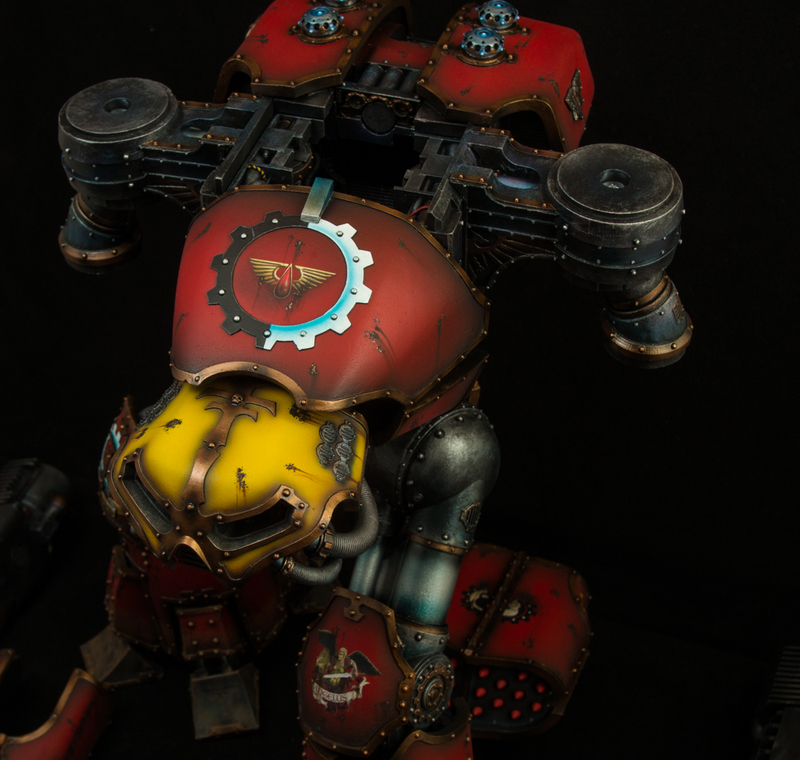 Looking back to my earlier models, I do have a more brighter red for my paintjob now - been trying to push the contrast a bit more than my old work.